The Animation Component is a special component used for creating keyframe animation channels. The component contains a pre-defined network utilizing a Keyframe CHOP and a number of Table DATs to define the animated CHOP channels. The Animation Editor is the user interface for creating and editing the animation of the Animation Component. The Animation Component has both in and out CHOP connectors. With no input connected, the Animation Component's index loops over the time range of the channels. The CHOP input can be used to manually control the index of the animated channels. For example, if the channels are keyed from frame 1 to 600, you can connect an input to the component and manually drive the animation output by feeding it a number between 1 and 600 (indexes outside the range will use the channel extend conditions). 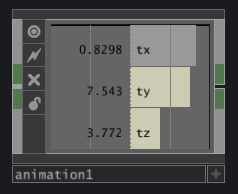 Using the Keyframe CHOP's Index Units menu, you can drive the animation with numbers expressed in seconds, samples, or a fraction where 0 is the start and 1 is the end. Animation Component Outputs	The CHOP output gives access to the animation channel's current value. CHOPs can be directly connected or a Null CHOP may be appended for exporting the channels to parameters. The current channel values can also be viewed by turning on the Animation Component's node viewer. 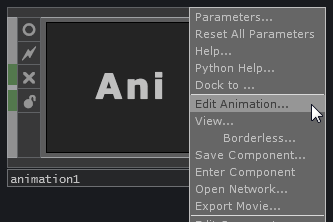 To open the Animation Editor, right-click on an Animation COMP and select Edit Animation... to open that animation in the editor. You can also change any pane to Animation Editor type and the Editor will open whilst pointing to the last Animation COMP that was scoped. Then you can create and keyframe animation channels. Refer to the Animation Editor for instructions on keyframing. Time Reference timeref - The location the Animation COMP looks to for its time information. This is used for default channel range and rate when the Type parameter on the Range page is set to Timeline. Play Mode playmode - ⊞ - Specifies the method used to playback the animation or allows the output the entire animation curve. Locked to Timeline locked - This mode locks the animation position to the timeline. Scrubbing or jumping in the timeline will change the animation position accordingly. The parameters Play, Speed, Cue, and Cue Point are disabled in this mode since the timeline is directly controlling the animation's position. Use Input Index input - This mode allows the user to specify a particular position in the animation using the index input on the Animation COMP (the CHOP input to the Animation COMP). The Input Index Unit parameter can be used to change the units of the input channel. Use this mode for random access to any location in the animation for maximum flexibility. Output Full Range outputrange - This option outputs the entire animation channel range. This is useful for using the Animation COMP to create custom lookup curves/channels. Play play - Animation plays when 1 and stops when 0. This animation playback control is only available when Play Mode is Sequential. Speed speed - This is a speed multiplier which only works when Play Mode is Sequential. A value of 1 is the default playback speed. A value of 2 is double speed, 0.5 is half speed and so on. Negative values will play the animation backwards. Cue Point cuepoint - Set any index in the animation as a point to jump to. Only available when Play Mode is Sequential. Input Index Unit inputindexunit - ⊞ - When Play Mode is set to Use Input Index use this menu to choose the units for the index input channel. For example, choose between setting the index with frames or seconds. The Units X option sets the index to use the key information directly from the key DAT table inside the Animation COMP, disregarding any custom settings found in the attributes DAT table. Cyclic Range cyclic - ⊞ - Adapts the range of the animation for cyclic or non-cyclic input indices. When using a cyclic input index the lookup value for index 0.0 and 1.0 result in the same value. To avoid this, set Cyclic Range to Yes and the lookup will cycle smoothly. Automatic auto - Checks the right extend condition of each channel (Assumes type cycle and mirror are cyclic lookups). Yes yes - Cycles the output when index is outside the animation range. No no - Does not cycle the output when index is outside the animation range. Specify Edit Attributes specifyedit - Turn this on to enable the edit attributes parameter below. Edit Origin editorigin - Changes the origin of the animation channel edits. This does not change the data stored in the key DAT table, but it does effect the channels display in the graph and playback of the animation. Edit Rate editrate - Changes the rate of the animation channel edits. This does not change the data stored in the key DAT table, but it does effect the channels display in the graph and playback of the animation. Edit Animation... editanimation - Clicking this button will open this Animation COMP in the Animation Editor.